From Goodreads – Amanda Obermann. Code name Iris. It’s Testing Day. The day that comes without warning, the day when all juniors and seniors at The Peel Academy undergo a series of intense physical and psychological tests to see if they’re ready to graduate and become government operatives. Amanda and her boyfriend Abe are top students, and they’ve just endured thirty-six hours of testing. But they’re juniors and don’t expect to graduate. That’ll happen next year, when they plan to join the CIA—together. But when the graduates are announced, the results are shocking. Amanda has been chosen—the first junior in decades. And she receives the opportunity of a lifetime: to join a secret government organization called the Annum Guard and travel through time to change the course of history. But in order to become the Eighth Guardian in this exclusive group, Amanda must say good-bye to everything—her name, her family, and even Abe—forever. Who is really behind the Annum Guard? And can she trust them with her life? 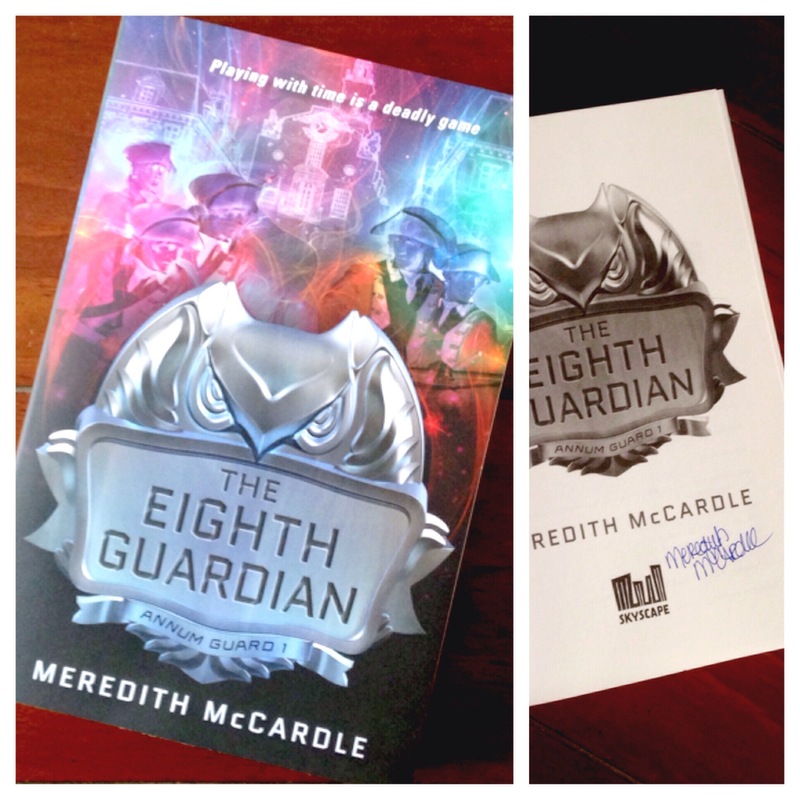 I had the privilege of beta reading The Eighth Guardian for Meredith last year and have since reread the paperback (which I’m giving away today — see below!). Guys, this book is so cool. It’s time travel done right, full of twists and betrayal and fascinating historical reference; the stakes are unbelievably high. The Eighth Guardian is a smart, smart book. It’s super fast-paced. The writing is top-notch. It’s a novel that makes you think. It makes you work for answers, and the payoffs are huge. Every chapter is a surprise, and almost no one’s who they originally appear to be. I love how Meredith plays with the past, bending important historical events to work with her plot. And I love how relentlessly she challenges Iris, who quickly learns that there are no easy solutions, especially when it comes to altering history. I’m so, so happy that The Eighth Guardian is the first book in a series, and I can’t wait to follow Iris on more adventures through the past! 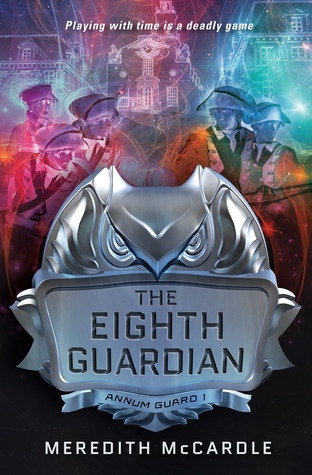 Want to win a signed paperback copy of The Eighth Guardian before its release? Well, lucky you, because I’m giving one away today!